Make 2017 your best year ever. All you have to do is to make January Veganuary. Pledge to go veg. Although veganism has shot up 360% in the UK over the past decade, Veganuary founders Matthew Glover and Jane Land didn't quite know how to go about it. "I'd never met another vegan so I had no one to go to for advice," says Glover, a longtime vegetarian and animal rights activist. "If only Veganuary had been around then!" Instead, Glover and Land created it. Four years ago, they launched Veganuary, an epic online vegan resource that gives you all the intel you need to succeed -- from vegan mythbusters (yes, we get plenty of protein -- really) to lists of vegan products, including happy surprises like Oreos. "Accidentally vegan!" says Glover. "I'll never starve!" Vegan Oreos are nice, but are they worth creating a whole vegan kickstart program and website? Once the giddiness of their idea wore off, the York-based couple weren't sure, either. When they debuted Veganuary in 2013, Land prayed a hundred people would pledge. Glover was pushing for a thousand. After 3,000 people pledged, they realized, "the world was ready for a vegan month," says Land. "We ploughed the rest of our savings into building a much bigger and better website." It's paid off big time. Over 24,000 people have pledged to go veg for Veganuary already this season. Not only does it beat the 23,000 people who participated last year, it includes couture queen Stella McCartney and um, me. If you want videos of factory farming animal abuse, Veganuary has them, but Glover and Land designed Veganuary to offer more than that. "Our attitude has always been supportive," says Land. Not only can you download a vegan starter kit, Veganuary participants can download a free vegan celeb recipe booklet. UK restaurant chains are signing on and adding vegan options to their menus. It's all part of Veganuary's goal to make vegan "more acceptable and accessible, something fun, a challenge perhaps, but a positive one." Veganuary has been positive for Land and Glover, as well. "I think we've become much more conscious consumers." They've discovered being vegan goes beyond Oreos. "We've experimented more with cooking," says Land. "But we're not even part way through the 500 recipes on Veganuary.com." She and Glover want to make Veganuary a delicious experience for everyone, "to change public attitudes about veganism, to make it more mainstream, and make the transition to vegan as easy and enjoyable as possible, to get people to try vegan and stay vegan." Glover, Veganuary's co-founder, is "a curry man," according to Land. In honor of him and Veganuary, I've adapted this recipe from Madhur Jaffrey, author of cookbooks including the new "Vegetarian India," actress and source for all things amazing and Indian. I've kept the spirit and spice of her recipe but streamlined the ingredients -- mostly dried spices -- to keep things cheap and cheery. Amchoor, dried mango powder, is awesome, but lemon juice is cheaper, easier to come by and still provides a tart thrill. 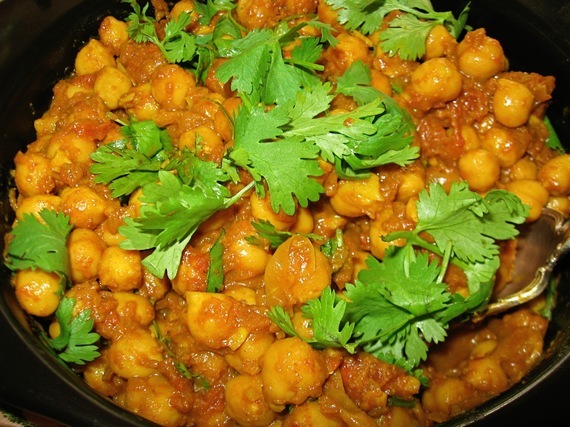 Serve chana masala with brown basmati rice or with naan or chapati, gorgeous Indian flatbreads. It's an easy, beany way to celebrate Global Pulse Day on January 18 and to enjoy Veganuary all month long. Heat oil in a large soup pot over medium-high heat. Add minced onions and garlic. Add minced chili, if desired. Cook, stirring, for about 10 minutes, or until the vegetables soften and turn into a golden paste. Stir in coriander, cumin, cayenne, turmeric and paprika. Add tomatoes, cinnamon stick, amchoor or lemon juice. Stir in chickpeas and 1/2 cup of chickpea broth or water. Reduce heat to low. Cover and simmer for 20 minutes. Remove cover and give mixture a stir. The sauce should be thick enough to coat the chickpeas. If it seems too soupy, continue cooking, uncovered for another 5 minutes or so. Season with sea salt to taste, garnish with chopped coriander or ginger. Or both. Covered and refrigerated, chana masala keeps for several days and the flavors are even richer the day after you make it. This is a revised version of an encore post, which originally ran on January 4, 2016.